The Panama Canal (Spanish: Canal de Panamá) is an artificial 48-mile (77 km) waterway in Panama that connects the Atlantic Ocean with the Pacific Ocean. 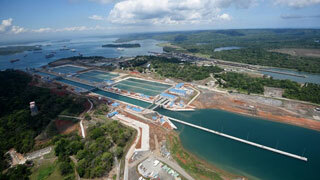 The canal cuts across the Isthmus of Panama and is a key conduit for international maritime trade. This article uses material from the Wikipedia article "Panama Canal", which is released under the Creative Commons Attribution-Share-Alike 3.0 License.